Ulverston Country Market is a successful, friendly co-operative with a community feel. Run in accordance with the rules of Country Markets Limited, a nationwide organisation established over ninety years ago, encouraging people to discover the diversity and deliciousness of local British food as well as showcasing talented crafts people and artists. Ulverston members bring to our market a wide variety of high quality produce with some travelling from near-by Grange-Over-Sands, Carnforth and Morecambe. Many members sell more than one type of produce being experienced bakers and preserve makers as well as gardeners, bee keepers and hen keepers, often bringing fresh fruit, flowers and vegetables from their own gardens or small holdings. Fancy a lazy breakfast, we have fresh baked bread, delicious Cumbrian honey and marmalades along with local free range eggs. Feel like a picnic on the Hoad or down by the canal? We have cheese scones and fruit scones along with home made chutneys and jams. Well that's covered too. So many home baked cakes from Victoria sponges to fairy cakes, Ma's bar cake to lemon drizzle, iced loaf cakes, tea loaves and fruit loaves. There's also a good selection of biscuits to enjoy with a refreshing cuppa when you get home, including butter shortbread, ginger fairings and ginger fudge shortbread. We have a great choice of vegetarian options, and cakes made with no gluten or dairy containing ingredients are also available. Well that's the food sorted! 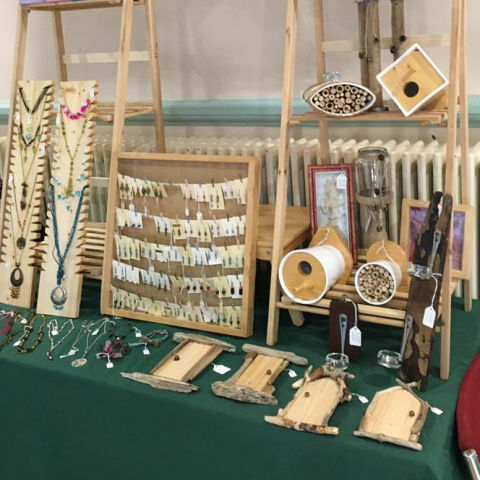 We also have some beautiful local home made crafts available including pottery, felting, crochet, rush work, wood craft, jewellery, art, photo producs and cards. Perfect for gifts or just because, we all need to treat ourselves sometimes. Come on in to the ante room at the Coro and take a look around. There's always a warm welcome! We take card payments too. Local home baked sweet and savoury goods and fresh bread. Home made preserves and local honey. Garden produce, fruit in season and plants. Come and visit us – we'd love to see you.